The Dera Sacha Sauda led by the Holy spiritual authority Revered Saint Gurmeet Ram Rahim Singh Ji Insan, initiated a welfare activity called “Nature Campaign”. The purpose of this campaign is to preserve the earth and control pollution across the planet, by planting trees in huge numbers. The volunteers of Dera Sacha Sauda have turned this into a miraculous mission by joining hands to come forward and spread this campaign around the globe. 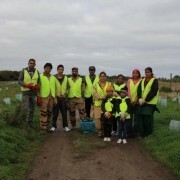 In legacy of such events, Dera Sacha Sauda volunteers of New South Wales, Australia organized a plantation drive in Dapto (Near Wollongong) wherein 707 saplings were planted in a single day. The excitement and zeal of the volunteers was worth mentioning and needless to say, the drive was a great success. Dera Sacha Sauda volunteers also prepared lunch for all guests, besides the plantation of trees. 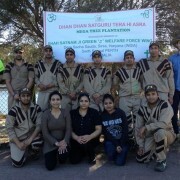 With the holy grace of Revered Saint Gurmeet Ram Rahim Singh Ji Insan, 24 members of Shah Satnam Ji Green ‘S’ Welfare Force Wing, along with 12 local residents of Perth (Australia) in association with the Council, planted 3300 saplings on 10th June 2012 at Belmont City (Garvey Park), Redcliffe. Seeing the devotion and passion of the followers, Council officials contacted the volunteers and requested for an unscheduled tree plantation drive on 18th June 2012. Accepting the request, 13 members of Shah Satnam Ji Green ‘S’ Welfare Force Wing reached the venue and planted 2000 saplings in about 2 ½ hours on 18th June. After the tree plantation, Naam Charcha (a spiritual programme where hymns are sung) was conducted and the members humbly thanked His Holiness Guru Ji. 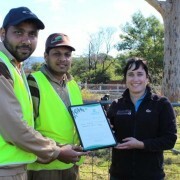 Australia stood first in tree plantation and charity for conducting welfare works. All over the world, it stood second by planting 40233 plants.